Ginger is a rain forest monocot about a metre high, with long, narrow leaves and spicate flowers. 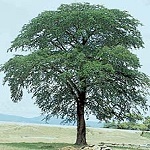 It has been grown in India and China since Antiquity. Seeds have never been found, ginger propagates through buddings from its knotty rhizome. Today India, Malaya, Taiwan and Fiji are the main exporters. The fresh ginger rhizome is a versatile ingredient of the far eastern cuisine, and is now commonly used in most of the world. Its flavour is lemony-balsamic and its taste is medium hot. 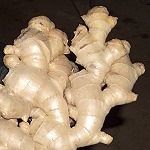 The lemony character of fresh ginger is due to citral. 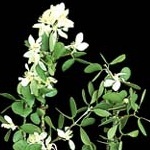 Major components of the essential oil are the sesquiterpenes beta-sesquiphellandrene and zingiberene. The 'sharp' constituents, causing the burning sensation on the mucous membranes, are substituted phenols (gingerols/shogaols) . 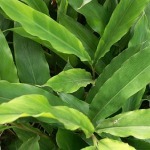 In the ginger family we also find cardamom, Elettaria cardamomum, galanga, Alpinia galanga, and turmeric, Curcuma longa. Grapefruit is believed to be a crossing of pomelo, C. maxima, and sweet orange, C. sinensis, having taken place in Barbados . 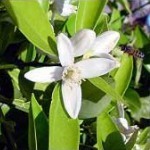 The special grapefruit aroma is characterized by its 'bitter-green-woody' nuance. As with most citrus fruits, grapefruit peel oil is dominated by (+)-limonene, but the particular grapefruit character is due to the sesquiterpene ketone nootkatone. The distinctive topnote of grapefruit juice is owing to trace amounts of 1-p-menthene-8-thiol, one of the most powerful odorants known (odour detection threshold in water ~ 0.0001 ppb) . New, milder, pink or red varieties of the grapefruit have become very popular. 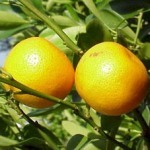 Recently, the grapefruit nuance has become popular in perfumery as a variation of the classical Eau de Cologne theme. Nootkatone, however, is rather expensive, and several compounds of somewhat similar character have been developed. A few examples are shown on the right. Methyl Pamplemousse ® is used at 8.5 % in the perfume Good Life (Davidoff 1998) . Dimethyl Octenone, or 4,7-dimethyl-6-octen-3-one, may give original and natural grapefruit effects in certain modern accords, according to Givaudan. The grapefruit note may even be found in some amides. N-methyl-N-phenyl-2-methylbutanamide or Gardamide ® (Quest) is described as having "a zesty grapefruit-citrus heart note with aspects of crisp rhubarb." Very much has been published on the aroma of different grapes and wines. 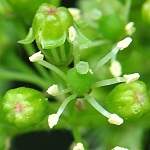 Here the tiny flowers of the grapevine mother plant shall be mentioned for their remarkable scent. For example, even in my temperate garden (in Hvalsoe, Denmark), the tiny young flowers of an old grapevine plant (unknown cultivar, see photos) emit a peculiar and rather powerful, rich, mellow fruity-woody scent with a melon-like nuance. Diane M. Martin et al. have shown that the grapevine flower scent (cv. 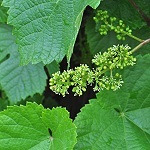 Cabernet Saugvignon) is released by the anthers (the male part of the flowers) and arises from the biosynthesis of sesquiterpenoid volatiles in the pollen grains. The sesquiterpenes (+)-valencene, E,E-a-farnesene, and (-)-7-epi-a-selinene were the most prominent, with up to 60% of all volatiles released at the height of emission . Gerhard Buchbauer et al. found that different vine-varieties (white and red) could be correlated with the pattern of sesquiterpene and terpenoid components in the flower headspace, among them valencene, farnesene, nerol and nerolidol   . 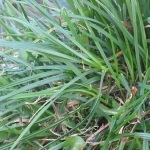 Lawn grass species/varieties are selected depending on local conditions and climate. 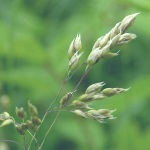 Temperate lawn grasses may be from the genera Lolium, Festuca, Poa and Agrostis, for example. cut . However, they are volatile and odor intensive. The odors of (Z)-3-hexenol and (Z)-3-hexenyl acetate are prototypes of what perfumers call 'green odors'. 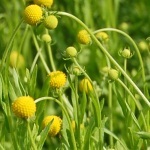 Both compounds are used in small amounts in perfumery to obtain natural, fresh green top notes. 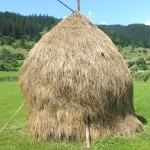 The sweet smell of new mown hay may be experienced where meadows with naturally mixed grasses are harvested in the summertime - in mountain areas, for example (forget about the large scale monocultures of modern farming!). green plants but is liberated upon withering of the grass  (see also sweetclover, tonka beans and woodruff). 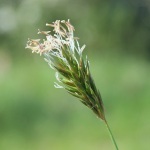 In perfumery, the "new mown hay" scent is almost an archetype. Based on coumarin (and analogues), and often supplemented with mossy and green nuances, this odor complex enters a multitude of fragrances. Actually coumarin was one of the first perfumery ingredients to be made by organic synthesis (Perkin 1875) . It found immediate applications as the gentlemen of the Jugend period should preferably smell discretely like landlords! 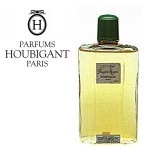 An early perfumery masterpiece utilizing synthetic coumarin was Fougère Royale (Houbigant 1882). This slow-growing tree endemic to the Gran Chaco region between Bolivia, Brazil, Paraguay and Argentina is the source of the so-called guaiac wood oil. The oil is obtained by steam distillation of the ground wood and sawdust as a dark yellowish, viscous liquid which solidifies at room temperature to a yellowish-white to light amber colored mass, melting at 40-50°C. It has a soft, "precious-woody" odor. Two sesquiterpene alcohols, guaiol and bulnesol, make up about 85 % of the oil . These alcohols may be acetylated, yielding "guaiyl acetate" which is highly valued in perfumery for its elegant, mild tea-rose-like odor and good fixative properties. P.S. 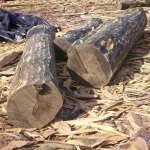 The very heavy and beautiful timber of B. sarmientoi has been utilized by indigenous peoples for eons. However, export levels have significantly increased in recent years. In addition to this, the loss of entire forests due to the deforestation associated to the expanding agricultural frontier has generated a need for greater conservation efforts so that the resource may be used sustainably . 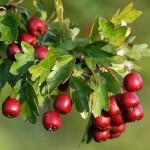 Specialists are often needed to determine the identity of hawthorn species. Hawthorns cross-breed easily, forming a multitude of hybrids, and speciation seems to continue. Hawthorn thrives in brushwood and pastures. In southern Scandinavia it blooms in May. The berries are eaten by birds during the winter, whereby the seeds are spread. 3-pyridinecarboxaldehyde. Other odor determining volatiles are benzaldehyde, 4-methoxybenzaldehyde (anisaldehyde) and methyl 4-methoxybenzoate (methyl anisate) . Etymology: Gr. 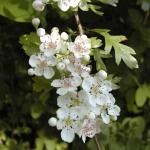 krataigos, the name of a hawthorn species. In Germany hawthorn is called Weissdorn, in France aubépine. 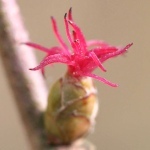 There are some ten species of hazels, all from the northern hemisphere. 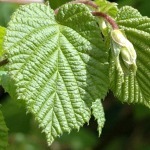 Common hazel is found in most of Europe. In the western Pyrenees, for example, it forms a major part of the natural forest vegetation together with beech and box. Hazel is flowering in early spring long before foliation. 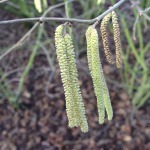 The light male catkins are hanging from the leafless branches. The tiny female flowers, unknown to most people, have their ruby red stigmas protrude from what looks like ordinary buds (enlarged 6 x in the photo). or 5-methyl-2-hepten-4-one, and resorcinol dimethyl ether, or 1,3-dimethoxybenzene, the latter being especially evident from old hazelnuts. It has also been detected in Port Wine   . On roasting, hazelnuts get a delicate crisp texture and a rich aroma from specific browning reactions, generating small amounts of pyrazines, pyrroles, etc. Roasted hazelnuts are used on a very large scale in chocolate bars, nut truffles, etc. 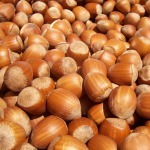 Turkey is the world’s largest producer of hazelnuts, contributing approximately 70% of the global production . Etymology: Lat. Corulus, the old Latin name for hazel; Lat. avellana, from Avella or Avella Vecchia, a commercial centre east of Napoli, formerly famous for its hazelnut trade. The Heleniums are all American. 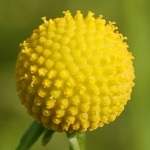 Helenium aromaticum, popularly called 'pineapples', is a perennial herb from Chile's alto plano, sometimes grown in European gardens as a 'scent plant' by connoisseurs (the above photos are from the garden of the Faculty of Life Sciences, University of Copenhagen). 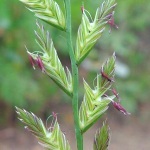 The petal-less, composite flowers are about 1 cm across. The whole plant, and especially the flower-heads, give off a tremendous boost of fruity pineapple-like aroma when squeezed. The essential oil of the dried flowers consists of 80 % esters, mainly of methyl-branched alcohols, e.g. 3-methyl-2-buten-1-ol (prenyl alcohol), 3-methyl-3-buten-1-ol and (Z)-2-methyl-2-buten-1,4-diol, with acetic acid (R = CH3) and short chain methyl-branched carboxylic acids. Moreover, it contains sesquiterpene lactones of toxicological and pharmacological interest, especially because of their cytotoxic and antitumor activities, e.g. aromatin .